I often talk about combining empathy and imagination with factual evidence when writing about history because that’s what works for me. The story of an individual becomes real when I can picture them clearly going about the everyday tasks in life. That’s just imagination but empathy adds something extra, the ingredient that allows a writer to have (even in just a small way) a sense of what someone else was feeling. When I started writing about the lives of John and Georgiana Molloy, lives lived nearly two hundred years ago, the scenes that became most real were the scenes that came alive in my own mind. When I thought about how it would feel to walk in deep snow collecting berries, or what it would be like to read in front of a smoking coal fire in a room lit only by oil lamps, the words to describe those experiences arrived much more easily. It’s perhaps not surprising that some of my most fruitful imaginings were associated with Georgiana’s clothing. I don’t really know how it feels to wear whalebone stays all day while collecting plants in the hot sun or to dig in a muddy paddock wearing an ankle length dress but trying to understand how women’s clothing affected their lives certainly helps. I don’t have to think much about clothes once I’m dressed in the morning because I never wear anything uncomfortable. Georgiana wore a range of different styles in her thirty-seven years, all of them restrictive in one way or another. She lived through significant changes in the design of women’s dresses and underclothes. Her ‘Jane Austen’ lifestyle is often referred to but Austen was born in 1775 and died in 1817 when Georgiana was twelve. Most of her novels had been published by 1818. The dress shape we associate with her heroines was only fashionable in Georgiana’s youth during the Regency period and had shifted significantly by 1843, when Georgiana died, to what we recognise as a ‘Victorian’ silhouette. The simplest view of those changes is in the lowering of the waistline but there was a lot more going on. 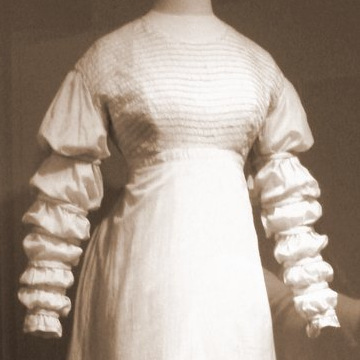 This ‘day dress’ in pale, soft muslin dates from about 1820, when Georgiana was thirteen years old and must have been made towards the end of the fashion for the ‘Empire line’ so typically worn by Austen’s heroines in films like ‘Pride & Prejudice. The waistline is already lower than earlier styles. A child’s version of this style is worn by little Georgiana in her portrait circa 1810. The waist is pulled in just below the bust and the long, loose skirt is made of very fine fabric. The Neo-classical influences of Greek and Roman clothing are clear and became even more popular during the Napoleonic empire when French fashions were copied by women in Britain. With the final defeat of Napoleon at the Battle of Waterloo in 1815, the Empire style fell out of favour and it’s probably just as well. 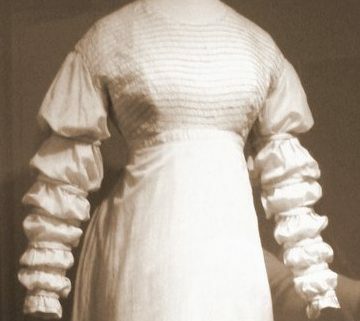 Although the shape was fairly comfortable with only soft stays being required beneath the bodice, the fabrics used were so diaphanous that they were often transparent and, if they weren’t, they became very revealing if a lady was caught in the rain or walking against the wind! Opaque, thigh-length chemises were worn underneath for modesty and these can often be seen in contemporary portraits showing clearly through the skirt. By the time Georgiana was away at school in London, in 1820, dress material was much less gauzy, daywear necklines were higher and waistlines slightly lower and by 1829 when the familiar portrait was painted of her in a black velvet dress we can see the very beginnings of the Victorian shape. The last styles she wore, during the early years of Queen Victoria’s reign, were held in tightly by whalebone stays with a flat busk for separation at the front and a very full skirt held out by an underskirt. The tiny-waisted silhouette became more extreme in the following years as seen in photographs of Georgiana’s daughters, their waists exaggerated by big, crinoline-lifted skirts. It was the beginning of ‘consumption chic’, sadly fashionable because women became very thin when they were suffering from tuberculosis; they also became pale with very flushed cheeks and dewy complexions, the symptoms of a terrible disease that came to be viewed as attractive.